The contact for these formation ministries is Yvonne Graves at 313-883-2862 unless otherwise noted. Please let us know if you’d like to join in! Youth Ministry: Ages 13-18 please join Y-FACT on Fridays at Sacred Heart Major Seminary from 6:30-9pm to hone leadership skills, investigate higher education, discuss and profess our faith, explore vocations, etc. We plan for and institute a “Lock In” for urban teens, enact the MLK Service Day, attend Youth Ministry Conferences, and more. Teens are needed to participate and adults are needed to assist/chaperone monthly or with special activities. Youth Mass Support: On 5th Sundays, the youth of St. Moses are part of the choir, lectors, Eucharistic Ministers, greeters and ushers; after Mass they lead hospitality. Rehearsals precede these Masses. Adults are needed to support this effort. Contact Kurt Hill 734-879-0584. Service Leader/Chaperone: Seek out and organize service opportunities for our children throughout the year; attend and chaperone the events. Approximate time commitment is a couple hours to research service opportunities and 3 – 4 hours on Saturdays or summer days a few times a year. First Communion and First Reconciliation Classes: Catechists needed! 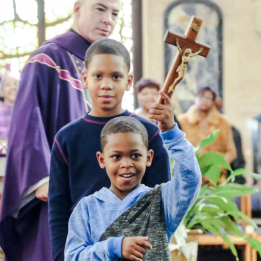 Classes are twice monthly for about 2 hours immediately following the Masses at each parish, October through May/June, plus parent meetings, a half day retreat on a Saturday and a rehearsal. Confirmation: Be a catechist, mentor, or chaperone as we work with other urban parishes to prepare our youth for this sacrament, meeting twice a month at rotating sites. We have two retreats, a “slow mass,” a tour of historic Catholic churches, and more. Vacation Bible School: Adults and teens are needed for one week in July or August from 10-2. Teens are group leaders; at lunchtime, adults eat with the children so teens can have a break together.